Solid filmmaking with great performances, even if the actual movie is more weird than actually scary. 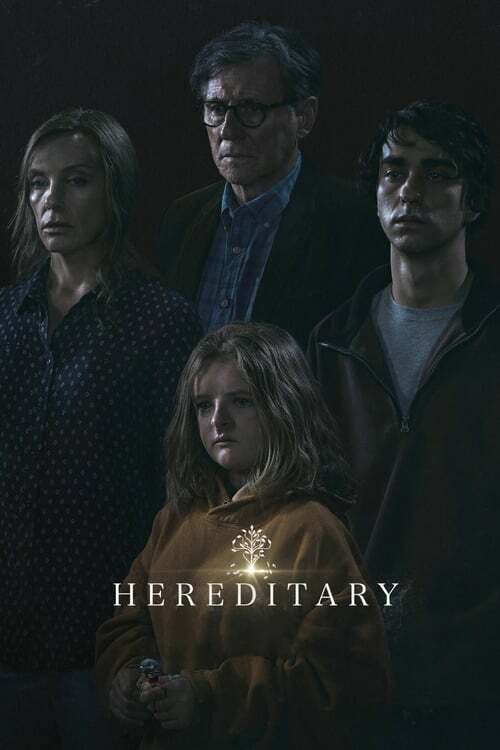 Hereditary is the feature directorial debut of Ari Aster, and since making its mark at Sundance has been creating huge buzz as “the scariest movie of the year” for some critics and viewers. I wouldn’t go that far, as it’s more a dark drama than pure horror, though I will say this: it’s really frigging weird. I’ve read the film was somehow inspired by Aster’s own life experiences, though he’s reluctant to go into details. I’m almost worried to know… there’s some weird (and weirdly devastating) stuff in this movie. Grandma has just died and the Graham family readies themselves for the funeral. They consist of mom Annie (Toni Collette) who creates miniatures for a living, detached father Steve (Gabriel Byrne), teenage stoner son Peter (Alex Wolff), and oddball loner daughter Charlie (Milly Shapiro). This death of the family matriarch uncovers tensions between them, revealing dark secrets better left buried. The grief and regret weighs heavily on each member of the family in their own way. Annie sees visions of her now dead mother and remembers the atrocities she’s caused as well as the horrific deaths in her family tree. Charlie creates demented art in the memory of her grandmother. Peter dips into drugs with his friends all while trying to impress a girl at school. Steve literally disappears into his work, absent for most of the film. The family suffers another tragic loss, Annie makes friends with a woman from her grief support group, Joan (Ann Dowd). At first a lent ear for Annie to vent to and a shoulder for her to cry on, Joan quickly becomes a doorway into a much stranger means of coping: communicating with the dead. Annie is at first skeptical, but as she becomes more receptive to the possibilities, she lets a mysterious malevolent force into her family’s lives. Saying Hereditary isn’t the scariest movie ever doesn’t mean it’s a bad movie. It’s not; but it sure is weird! There were many times it felt a bit like 2015’s The Witch, another so-called “scary” masterpiece that also received critical acclaim and which I also thought was really weird and completely un-scary. Maybe it’s just me? Toni Collette is getting a lot of buzz for her performance in this movie and rightly so. She definitely gives a career-best performance here and has such a range of emotion I can see why she would want this part so bad. But I feel like putting all the attention on Collette with little or no mention of the rest of the cast is to do a disservice to the rest of the amazing actors involved. All the on-screen talent did amazing jobs in their roles, making this an emotional tour de force that we rarely get to see in a so-called “horror” movie. The look from cinematographer Pawel Pogorzelski is bold and interesting, with camera work that gives the film a trippiness I hadn’t expected. At times, however, it can seem a little flat, more like a horror movie from the 1970s with washed-out scenes and the 35mm look. Perhaps this was intentional, but the visual differences can be striking. There were some major story elements that are missing from the opening of this review, as to list everything would spoil some of the bigger surprises. Even as is, I fear I may have over-shared what this movie is about, and so I apologize for that. This is a hard movie to talk about without giving away elements that will surprise you, especially with some of the brave and typically unseen story choices. The final act is, as I’ve delicately stated before, really frigging weird and worth experiencing for yourselves. With a running time of 127-minutes it could have benefited from tighter editing from Lucian Johnston (editor of Hostiles) and Jennifer Lame (editor of Manchester by the Sea). The middle tends to sag, in between creepy apparitions and heartfelt monologues. I’d likely have enjoyed the film a bit more if it were about 15 minutes shorter. Overall, Hereditary is solid filmmaking with fantastic performances all-around, even if I found the story a little too bizarre to truly get swept up in. As with most genre films it’s more about the experience rather than actual plotting, which is much weirder than you’d expect going in. This horror film would be better classified as an arthouse drama with squirmy beats, but I’ll bet that wouldn’t have been as attention-getting as putting “scariest movie” on the poster.